Andy Rathbone » How do I sort my contacts in Outlook Express? Q: I’m using Outlook Express in Windows XP. How can I list my contacts in alphabetical order? A: The once-popular Outlook Express e-mail program enjoyed a good ten-year run, from Windows 3 to Windows XP. Microsoft’s Windows Vista finally killed it, unfortunately, substituting Windows Mail, which died a short two years later. Outlook Express lovers can still run the popular program in Windows 7, however. 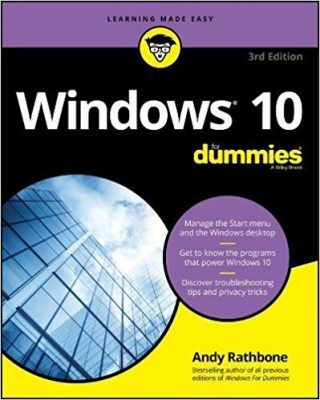 Just download and install Microsoft’s Windows XP Mode, and you’ll create a fully-functional Windows XP computer running in its own window on your desktop. And inside that window, you’ll find Outlook Express awaiting on Windows XP’s familiar Start menu. But whether you’re running Outlook Express in Windows 98, Windows XP or Windows 7, the program lets you view and sort your Contacts in either of two ways. 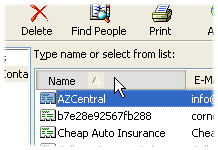 To see your Address Book in Outlook Express, click the Addresses icon from the program’s menu bar along the top (shown to the left). The Address Book window appears, listing your contacts’ names and e-mail addresses, each in their own columns. The Address Book normally lists your contacts alphabetically by name. 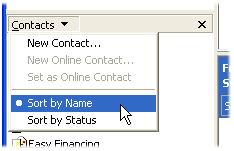 Click the word “Name” atop the column listing your contact’s names (shown to the left). Outlook Express quickly sorts that particular row alphabetically. Click it again to sorts in reverse alphabetical order. In fact, this trick works throughout Windows whenever you see a list of files, in any version of Windows, including Windows 7. Clicking any column’s header quickly sorts those files by that header’s name. You can sort files by name, size, or creation date; you’ll find a wide variety of column headers in your Documents, Music, Pictures and Videos folders. You can sort photos by the date they were taken, for example, handy when trying to find vacation photos from a specific trip. Depending on Outlook Express’ layout, Outlook Express may list your contacts’ names along the program’s left edge, usually in the bottom left corner. Click the word Contacts, right above the box listing your contacts’ names. When the drop-down menu appears, choose Sort by Name. Outlook Express will sort the names alphabetically by their first name.